James H. Adams was the owner of a ranch in Covina that he named El Dorado. Most of it was located between San Bernardino Road to the north, Badillo Street to the south, Fourth Street on the east, and Hollenbeck on the west. The land had been planted to oranges in 1886 by the previous owner Joseph S. Phillips. Mr. Phillips had previously raised raisin grapes but felt that grapes did not bring a large enough profit. The grove was protected on the east and north by a tall hedge of eucalyptus and cypress trees, outside of which were planted alternately pepper trees and palms. The ranch is described in the 1896 and 1898 holiday supplements of the Covina Argus newspaper which is clearly intended as a promotional pamphlet for the town and its real estate. The editor, Louie Matthews, suggests that the locals send copies to their friends and relatives in the east to encourage them to move to California. It is interesting that while the supplement describes the beauty and elegance of many of the Covina ranch homes, such as Antone Kerckhoff's "Francisquita" and C.H. Ruddock's "Mountain View," when it describes the Adams ranch it says, "All the buildings on this property are neat and modern structures, conspicuous among them being the barn and coach-house, which...is one of the handsomest and best-appointed structures of its kind in the county of Los Angeles." High praise for a barn. The outstanding feature of the Adams barn is a cupola on posts above the center of the roof that resembles one of the domes of Saint Basil's Cathedral in Moscow. The barn also had windows, a rarity in barns. 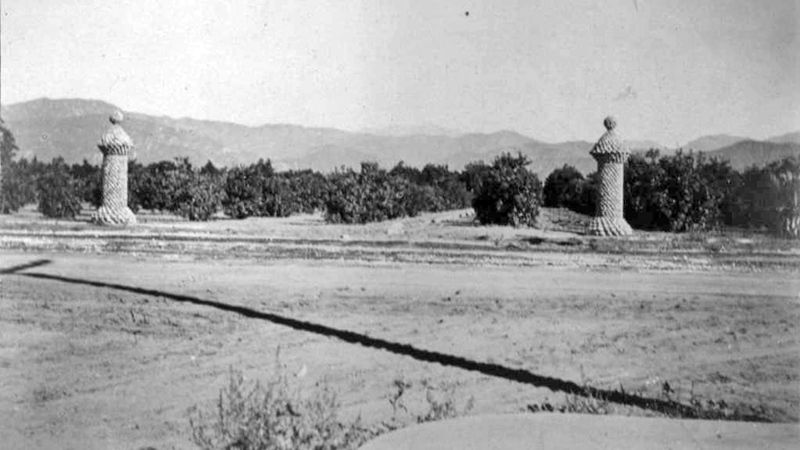 The Covina Argus describes the ranch as "One of the finest ranches of this justly-celebrated citrus-fruit-growing locality, both for beauty of situation, fertility of soil and high state of cultivation in which it is maintained, and the number of ornamental trees surrounding it, is the forty-five-acre ranch of Mr. J.H. Adams." Two of the Adams stone pillars on Badillo Street in the 19-aughts. The east curb of Fifth Street can be seen in the foreground. Photo courtesy Covina Public Library. Today, perhaps the only remaining physical feature of the Adams Ranch is the pair of stone pillars on the east side of Hollenbeck about 125 feet south of San Bernardino Road. These were built at the entrance to the ranch house and barn by Jack Nelson, the caretaker. Originally there were at least eight other identical pillars on the perimeter of the ranch. There were single pillars at the diagonally opposite corners, one at Hollenbeck and Badillo and one at San Bernardino and Fourth Street. There was a pair on the south side of Badillo about 60 feet apart in front of the former Pitzer residence. There were two pair on the east side of Fourth Street, one pair flanking Orange Street, and the other pair on each side of Cottage Street. They were about 45 feet apart. The single pillar at San Bernardino and Fourth was also on the east side of Fourth. Apparently Mr. Adams felt that the land comprising Fourth Street belonged to him. Even with that land, his pillars enclosed slightly less than 40 acres. The Argus said that this ranch included 40 acres of oranges planted in 1886 and five acres of lemons. That five acres was most likely south of Badillo. 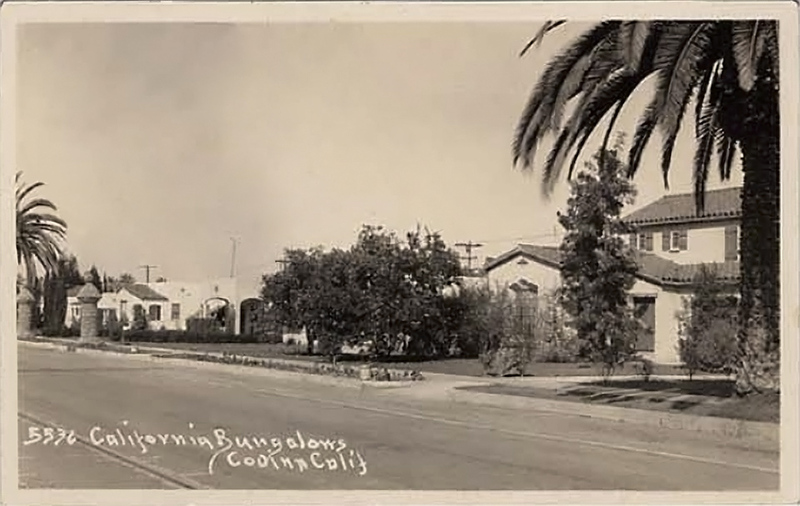 Postcard from the 1930s showing the same two Adams stone pillars on Badillo Street (far left). Several of these houses still stand today. In 1921, the easterly ten acres of the ranch was sold to the City of Covina for $2,000 an acre, and became the City Park. At that time the Covina Union High School had a single classroom building located on the west side of South Citrus Avenue between Dexter and Puente and felt the need for more room. The trustees were ready to buy the remaining 30 acres of the Adams Ranch between Badillo and San Bernardino at the same price but found that the seller wanted $2,500 per acre for the remainder. The school district appointed a committee to study the matter and they decided instead of buying the land, to build an additional building on the existing campus next to Puente Avenue. It was called the Science Building. The westerly 30 acres was sold to be subdivided in 1924. I am pleased that my parents Tom and Edith Reed were among the early purchasers of a lot in the subdivision in 1924. They chose a lot just east of the location of the old Adams barn. I still live there. Mr. Raymond Finch bought the lot next door that must have been at least partially under the barn. Two lots of the Adams Park subdivision were not purchased for residential purposes but instead were developed as a miniature golf course. These were the two lots on San Bernardino Road next to Valencia Street directly across the street from the city park. Unfortunately the Great Depression occurred and made such entertainment as miniature golf unprofitable. The golf course was abandoned and became overgrown with shrubs, trees, and weeds. That made it an almost perfect playground for all the kids in the area. It was a wonderful place to play "Hide and Seek" or "Indians." As El Dorado, the Adams Ranch was as the Argus stated, "a model place, one which is the pride of its owner and the neighborhood, and the admiration of visitors." Now the City Park and Adams Park are the pride of their owners and of the neighborhood. "Images of America–Covina" by Barbara Ann Hall Ph.D. This article was originally published in the April, 2017 issue of "The Covina Citrus Peel," the official newsletter of the Covina Valley Historical Society, and is reproduced here with the permission of the author, Covina historian Glenn Reed.